If you like, throw a handful of frozen peas into the water along with the gnocchi. Makes: Serves 4 (with extra gnocchi left over). 1To make the gnocchi, bake the potatoes in a 350 F oven for about an hour, or until tender. (This keeps them from getting watery, and also retains more nutrients and potato flavour.) When they are cool enough to handle, peel them and press them through a potato ricer (looks like a giant garlic press - very effective in getting rid of all lumps) or mash until smooth with a potato masher. Stir in the egg, cream and salt until well blended, then stir in the flour. You should have a nice, soft dough - if it's sticky, add a bit more flour, a spoonful or so at a time. 2Divide the dough into 6 chunks, and roll each into a rope that's about 3/4" thick. With a knife or pastry cutter, chop into 3/4" pieces. Roll each piece over the tines of a fork (I do this by rolling the back of the fork back and forth over each piece, starting at a cut side so that it grips better), then place them on a lightly floured baking sheet. At this point, the gnocchi can be covered and refrigerated for up to 2 days, or frozen. 3To cook the lobster tail, put it in a medium pot with about half an inch of simmering water; cover and cook for 7 minutes. Remove the tail and set aside; continue to simmer the small amount of liquid until it reduces a bit, then add the butter and cook until it melts. To emulsify it, put it through the blender or blend it with a hand-held immersion blender - it should remain liquidy but as it cools will have a consistency closer to hollandaise. Pull the meat out of the lobster tail and chop it. 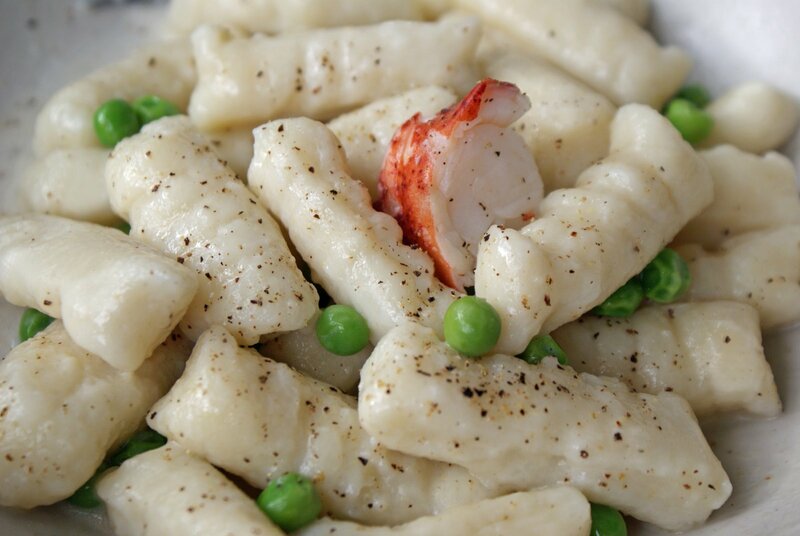 4When your lobster and sauce is ready, cook your gnocchi: bring a large pot of salted water to a boil and cook the gnocchi in batches, not crowding the pot, for about 4 minutes or until they rise to the surface of the water and puff up a bit. Remove to a bowl with a slotted spoon. 5Drizzle the sauce and lobster meat over the gnocchi, season with pepper if you like, toss to coat and serve.